San Sulpice is a marvelous, unfinished baroque church. It’s a few blocks from the Paris hotel my workshop group is staying in. The interior of this church was in an important scene in Dan Brown’s peculiar but popular book, The Da Vinci Code, which is largely set in Paris. The obelisk shown in this iPhoneograph plays a significant role. I shot my image using my iPhone 5, and processed it using the Lo-Mob and Plastic Bullet apps. I am staying around the corner from the Luxembourg Gardens, a fun place to photograph with its harmonious straight lines of trees and flowers in their springtime bloom. This is an example of iphoneography, shot with my iPhone 5, showing one of the aisles of trees. I processed it through Lo-Mob and Plastic Bullet while waiting for an appointment with a gallerist here in Paris. The good news is that I’ll be having an exhibit next April here in Paris, of my Botanique work and some monochromatic prints as well. The Opera Garnier in Paris is baroque and magnificent. It’s mostly not used for opera any more as they’ve built a modern opera house (I’ve heard, however, from several people who’ve been to the opera here). It does host ballet performances. This is a shot of an ornate reception room. Since tripods are not allowed I put the camera with a fisheye lens on the floor, set the self-timer, ran away, and took my chances, coming back to the camera ten seconds later after the exposure! Paris is often called the “City of Light”—perhaps it should also be called the City of Lights. Plural. As in many. You can see in this photo that everything is lit at night, like a giant playground for adults. But wait! There’s more. Every hour on the hour la Tour Eiffel starts giving off sparks like a giant fireworks candle. Stay tuned, many more photos of Paris to follow. Amazing that one can leave San Francisco and in one day be photographing in Paris! This is a view of the Seine River from the Ile St Louis in the center of Paris. The simple pleasures of waterdrop photography can be entrancing, and there is often ample complexity close to home, as in this composition of a waterdrop on a leaf, piggyback on yet another leaf! I wanted to touch base before I leave for France on Sunday. As you likely know, I will be leading a photography workshop in Paris. This is one of my dreams come true! My plan is to keep in touch by posting photos and stories from Paris about the ongoing adventure. You can also check the Photograph Paris with Harold Davis meetup group for updates and photos from the workshop. Before I leave I also wanted to alert you to a few opportunities related to Botanique, my Monochromatic Visions Kickstarter project, and my workshops. Thanks always for your support, interest in my work! Although Botanique is selling well, and despite some stories that the edition has been sold out, we do have some copies still available. The current price (for numbers 12-15) is $1,200. The Botanique presentation ships with white gloves for handling and a signed print of Red Poppies on Kozo Washi. The fine print: $50 shipping is additional. Sales tax is also additional (for CA residents only). Click here for more information about Botanique. If you are interested in a copy of Botanique, please contact Phyllis, [email protected]. The original idea of my Monochromatic Visions Kickstarter project was to fund the creation of a new monochromatic portfolio edition of my prints. This goal was very quickly reached, so I added a second “stretch goal”—to go to Japan and create a second washi portfolio of images from the old Japan road, Kumano kodo. This goal is well underway, and I’d appreciate any support you can give it. Currently, the Monochromatic Visions portfolio is available on Kickstarter for $1200, and there are two $650 copies available of the Kumano kodo portfolio. I want to point out that prints from the individual portfolios are also available, starting as low as $200 including shipping. You can choose any of the prints from the Monochromatic Visions portfolio at this price, which represents a very substantial discount off the normal price for prints from my studio (it is $550 and up). You can only take advantage of this offer via the Monochromatic Visions Kickstarter project. Click here to visit the Monochromatic Visions Kickstarter project. 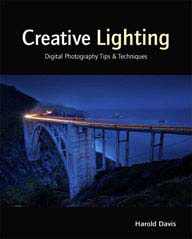 I have rescheduled the Composition in Night Photography webinar for Thursday, July 11, 2013. Click here for information and registration. 2013.12.07—2013.12.08—Photographing Flowers for Transparency: Two Day Workshop with Harold Davis—a unique opportunity to learn Harold’s techniques, workshop location is Berkeley, California. Limited space is available. About Harold Davis: Harold Davis is a professional photographer whose work is widely admired and collected. He is the author of many bestselling photography books. Harold Davis is a Moab printmaking Master. What happens when a photo is a file that languishes in a folder? It may be a little like the tree falling in the forest without recognition. Here are some of my “unseen” photos, published for the first time on my blog. I shot this image of rolling, and roiling waves, from the pier in Pacifica, California the other day. Roaring towards me in a steady wind-blown progression, these waves look almost like a rock face—hence the title, Granite Sea. A bright winter day found the clouds reflected at low tide on Bolinas Beach, California—captured with my lens aided by a polarizing filter to bring out the strength of the reflections and contrast in clouds and sky. Near sunset, I found this ruined stair under a crumbling pier in the old harbor of Port Richmond, California—looking for all the world like something out of an etching or drawing by M.C. Escher or Giovanni Battista Piranesi. Up at Step One, Amber face-painted all the pre-schoolers. Our Katie Rose became a tiger—not inappropriate for someone born with her fierce life force and will to survive. She’s also very sweet, at least when she gets her way! I’ll miss Katie and her brothers very much while I am away—but I’m glad to know they’ll be doing well, and that I’ll be coming home to Phyllis and the kids. Last week I spent some time wandering on Point Reyes with my oldest son Julian (he was off from school for the week). The land and sea were swept by a strong wind, which made photography difficult, but we had a great time being out in the weather. Looking at these wind-tossed waves reminded me that soon I will be across a different ocean, and far from home. Next week I am leaving for France, where I am leading a workshop in Paris. I’ll try to keep images and stories coming to this blog. To make this image I stacked two fast shutter speed captures (each was shot hand held at 1/640 of a second at f/13 and ISO 200). In the strong wind a tripod was hopeless, and I couldn’t hope to stack more than two hand held exposures. I next increased the contrast and tonal range by multi-processing the RAW files to add additional layers of light and dark. I like the way the Windswept Sea image has become an abstraction, an alternating pattern of lights and darks, that only comes into resolution as the ocean when I shift my eyes away from the image, and then back again. Please check out my Monochromatic Visions Kickstarter project, and if you are able to do so, I would greatly appreciate your support of my photographic goals. I’m very excited that our Monochromatic Visions Kickstarter was funded in less than 24 hours! Thanks so very for your support. Because of all the excitement around the Monochromatic Visions portfolio, I’ve added a dream “stretch goal”—with an ambitious $10,000 goal. This goal will fund sending me on a photographic pilgrimage to create a unique portfolio of old Japan with the intention of creating a monochromatic portfolio based on my journey. We’ve added some exciting new rewards related to the stretch goal (including the unique opportunity to walk with Harold in Japan while he creates the new Kumano Kodo portfolio), please check them out. And thanks ever so much for your support. 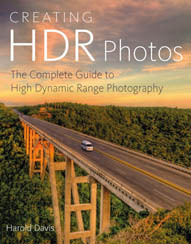 The photographs in Monochromatic Visions were created using high-dynamic range (HDR) techniques that will be explained in my forthcoming book Monochromatic HDR Photography from Focal Press. This process involves sequential multiple digital RAW exposures, or a single RAW exposure processed multiple times. The blended exposures or processes are then rendered into a single color master file. The final color version of the image is then remastered to monochrome, using innovative layering and processing techniques of my own invention. Check out Monochromatic Visions on Kickstarter. Hard to see among the debris at the forest floor, the tiny Calypso orchid can be photographed when conditions are right on the slopes of Mount Tamalpais for brief periods in the spring. I have been photographing the Mt Tamalpais Calypso orchid, Calypso bulbosa, also sometimes called a ‘Fairy slipper,’ for years. You can see a couple of my other photos of this marvelous flower, and read a bit about its background, in Close Encounters with Calypso. Yesterday Mark and I headed in search of the elusive Calypso as a dense fog swirled around Mount Tamalpais. By the time we found the first specimens, hiding among old leaves beneath tall trees on a steep and muddy slope, the clouds were intermittently breaking up. As I got to work I found that I was struggling to get my tripod low enough to the ground. Photographing this flower from above just didn’t work. So I improvised a sling made of my hat, twigs, and some raw earth, and finally got the camera stable enough to make this fairly long exposure (2/5 of a second). Exposure data: 105mm macro lens, 36mm extension tube, 2/5 of a second at f/18 and ISO 200, improvised earth-and-hat camera platform. I think perhaps that The Incredible Shrinking Man, a 1957 film about a man who shrinks to nothing following an encounter with a radioactive cloud, had an indelible impact on a portion of my visual aesthetic. I know that The Incredible Shrinking Man was one of the first movies I ever saw (what were my parents thinking?). No doubt due to my tender years, I took the pseudo-profundities uttered by Grant Williams, the actor who plays the shrinking man as, well, profundities. To this day, I enjoy playing with scale in my imagery. It’s one of my goals to create iconography that compels at least a second glance, and using indeterminate scale is one way to get there. For example, the Sand Dollar shown above is captured at near microscopic level. But the vista of badlands in Death Valley (far above) could easily be an enlargement of the pattern in the shell. You see, it’s all a circle, with the large and vast ultimately smaller than the small and tiny—or vice versa. For the record, the other movie I remember well from my early years was Some Like It Hot. My brother and I were supposed to be asleep in the back of the family station wagon at the drive-in movie theater. Now what artistic influence did Some Like It Hot have? I looked out over the vast Arizona plateau leading to the great canyon made by the Colorado Rover. The late autumn sun was setting quickly, creating shadows in the undulating up-country. If you look at the image sized larger it is easy to see tracks that extend across this apparently trackless waste. What would it be like to live here at the border of immensity? Exposure data: 120mm, three exposures at shutter speeds between 1/80 of a second and 1/320 of a second, each exposure at f/8 and ISO 200, tripod mounted; exposures combined and converted to monochromatic in Photoshop.